ANOVA is used to determine if there are differences in the mean in groups of continuous data. It answers the question...Is the mean of at least one group different than the mean of other (multiple) groups of data? The test is used in the ANALYZE phase of a DMAIC project. A GB/BB should be very comfortable using and understanding the mechanics behind this test. It is likely to be one of the most common tests that will be used by a Six Sigma project manager. ANOVA is a commonly used as a hypothesis test for means (not median or mode) and usually is applied for testing >2 means (use 1-sample t or 2-sample t test for one or two means testing respectively). Each sample is normally distributed. Each sample has equal variances. Each sample is independent. There are no patterns or trends present. The changing of one data point should not change another. The Y-data is variable type of data (such as time). The X-data is attribute data (such as appraiser name). BETWEEN sample variance is a study of the variation among all the samples usually due to process difference or factor changes. WITHIN sample variance explains the variation within each sample itself (look at a Box Plot of one data set to graphically comprehend this - the tip of one whisker to another). ANOVA answers the question if the means of several populations are statistically different or equal. It also computes a lot of other valuable insight that can help steer a GB/BB in a clearer direction. A statistical difference is found when the difference BETWEEN samples is large enough "relative to the difference WITHIN the samples. The t-test are limited to comparing up to just two groups. Where as, ANOVA can compare 3 groups, 15 groups, 25 groups, and more. 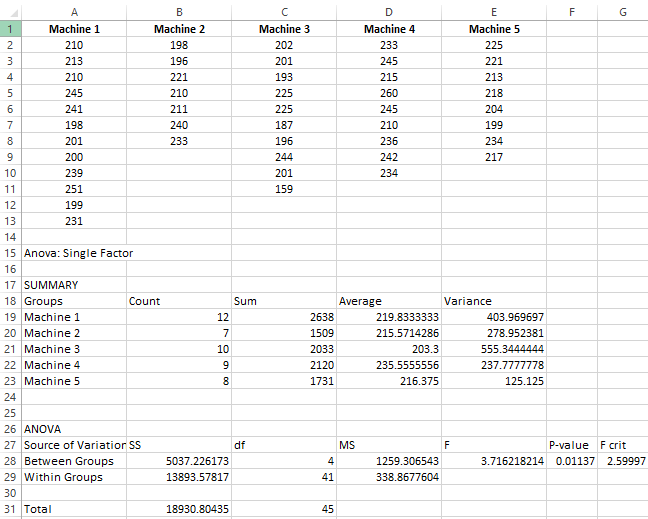 Using ANOVA to compare two sample means is equivalent to using a t-test to compare the means of independent samples. Factor (Process Input Variable - PIV, x): A controlled or uncontrolled variable (independent variable) whose influence is being evaluated. Factor Level (+1,-1, Hi, Low, + , - , A, B): Factor setting. Response (Process Output Variable - POV, y): The output of the process. Inference Space: Range of the factors being evaluated. Fit: Predicted value of the POV (y) with a specified setting of factors. Residual: Difference from the fit and actual experimental output. (read that carefully....it is possible that only one sample mean is different from the other 3, 50, or 100 sample means. Removing the one sample could completely change the result of the test. That is why visual depiction, such as Box Plots, can help find the drivers to the test result or samples that are flawed). If the Null Hypothesis, Ho, is found to be true, then we would not expect to see a lot of variation Between Samples. All the population means are considered equal. If Ho is not true, expect to see significant variation between the samples. This would imply that the difference between samples is large relative to the variation within samples. Reminder: Statistical significance does not always imply practical significance. Every numerical result needs to taken under scrutiny to determine if it makes sense in reality. If the Ho was rejected, determine which mean(s) are different. Looking at the Box Plot and Confidence Intervals are easy way to pick them out. Fisher's Pair-Wise comparison is another statistical method. Calculate Epsilon-squared. This explains the % of variation from a given factor. A low value may indicate that other factors may exist. Review statistical conclusion and state the practical conclusion. State the level(s) that are different if such is determined. In a completely randomized design (One-way ANOVA) there is only one independent variable (factor or "x") with >2 treatment levels (you could also use this for two levels) also called classifications. The sample sizes do not have to be equal. Determine if there is a significant difference of means in two or more appraisers. The results of a mock study where four appraisers were timed to make an inspection decision on a 13 widgets. There are 51 Degrees of Freedom computed from (13*4) - 1. Paul has the lowest average time per appraisal but Jim has lowest variation and the most consistent time for each appraisal. What this result doesn’t say is if the appraisals are correct! With these results a Six Sigma Project Manager would likely be very pleased that all are performing the same in terms of time spent making an appraisal and the variation from appraisal to appraisal is similar among each person (hopefully the correct appraisal too). This is likely a result of consistent training and adherence to the SOP's. However, the next questions from the Six Sigma Project Manager is....can this be improved or is it acceptable? Caution: It still may be possible that 19-20 seconds per appraisal is not acceptable by the company, or customer, and this still needs to be reduced. 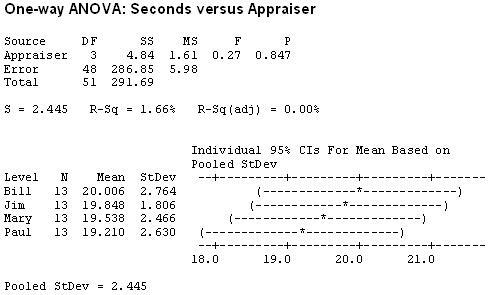 This One-Way ANOVA only indicates that there is not a statistical difference among the appraisers times. This test is not comparing the appraisers to a target value. The low F-statistic of 0.27 says the variation within the appraisers is greater than the variation between them. 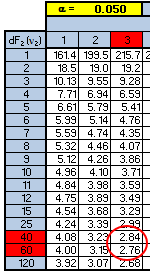 The F-critical value is 2.81 according to the statistical software (not shown above). Depending on the version of Excel there is an “Analysis ToolPak” add-in module that may be needed. 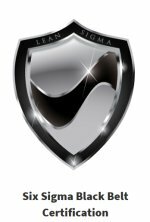 In this version depicted below it is called "XLMiner Analysis ToolPak". Go to the INSERT tab in this case (or could be under TOOLS). Type in ANOVA and click on the magnifying glass, the the XLMiner option will appear. Select ADD and the menu will pop up as shown on the right of the picture below. The following data was recorded across five machines. The team recorded the pieces per minute that were produced of the same PN 123XYZ under similar operating conditions and had to be acceptable pieces. They wanted to examine several things with one of them being if any of the machines mean performance varied from the other. Assume 95% Confidence Level. For example, the first time that Machine 1 ran a batch of PN 123XYZ it averaged 210 acceptable pieces/minute. Recall, that sample sizes do not have to be the same. Other factors can be added to this type of test and get more complicated but most statistical software programs can run Two-Way and Three-Way ANOVA. Use Two-Way ANOVA when there are two factors. When there are 3 or more factors use ANOVA General Linear Model. This module provides lessons and more detail about One-Way ANOVA. Understanding the basic meaning and applications for this commonly used test is necessary for any level of a Six Sigma Project Manager. Click here to purchase the One-Way ANOVA module and view others that are available. A multivariate analysis is a tool that evaluates differences among 2 or MORE FACTORS and between multiple groups simultaneously. There are Two-Way and Three-Way ANOVA tools as well but again those are limited to 2 & 3 factors respectively. Factors are differences in things such as, but not limited to, parts produced (its probably not a good idea to compare the production of pencils to the production of nails even if they run on similar machines), services delivered, time, different operating conditions, and customer requirements. Before jumping into a multivariate analysis, use ANOVA to focus on one factor at a time and learn from that analysis first, then use multivariate if something significant is found. Once the data is collected the ANOVA takes very little time and evaluating the factors in various ways only provides more and more insight as to their relationship. It is always better to have more than enough information, within reason, than not enough, especially when the analysis only takes a few minutes.